SUMMARY: All her life, Emmeline has been scorned by her Flatlander community. Deformed and tossed-away minutes after her birth, Emmeline defied the odds and lived. As she grows up, her neighbors scorn her for surviving and for her seeming ability to talk to cows. Even when she loses everything, Emmeline is determined to make it on her own, setting off a chain of events that cause Emmeline to discover her inner beauty, fall in love, and become world-famous. REVIEW: I loved this book! I've seen The Sweetest Spell compared to The Princess Bride, and I totally agree with those comparisons. I was entranced right from the first page, and it kept me reading well into the wee hours. The romance is sooo sweet, and I love the story's fairytale feel. 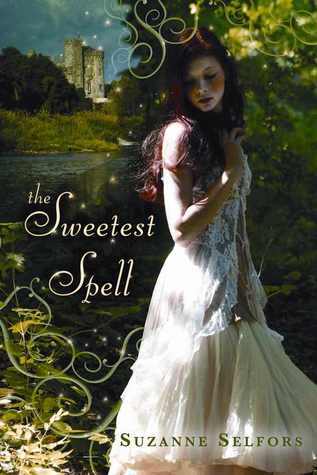 To my knowledge, The Sweetest Spell is not based on any particular fairytale, but it does have that medieval, "Anglish" countryside setting and a hefty dose of romance and royalty. Readers will predict a "happily ever after" ending, but the fun is in getting there. Plenty of fighting, scheming, magic, cruelty, and kindness lead up to that oh-so-sweet-and-anticipated first kiss. Absolutely magical. I love that Emmeline has a serious physical handicap, but she does not let it prevent her from living life on her own terms. While the taunts do hurt her feelings, she takes it in stride and often fights back with snarky comebacks that will make readers laugh out loud. Her rags-to-riches story smacks a bit of Cinderella, but Emmeline needs no prince to rescue her. Male leads Griffin and Owen and Beau are fleshed out well; each is interesting and unique. I especially love Owen's toughness and his absolute resistance to admitting his feelings for Emmeline. A large cast of supporting characters and secondary plot lines will make readers laugh, cry, and wish they, too, lived in a world where good always triumphs and evil never pays. THE BOTTOM LINE: While the premise (a girl magically makes chocolate and talks to cows) is a bit, um, different, The Sweetest Spell will easily hold its own among others in the fairy tale genre. Like chocolate, this one is super-sweet and satisfying. STATUS IN MY LIBRARY: Two copies on-order. I am going to add The Sweetest Spell to my 2012-2013 Lone Star Plus Reading List. Great review, I really need to find this one. Thank you for sharing it.